Have I met the requirements to practice in this state? Do I have the appropriate certification required to practice in this state? Does my training/experience match within the scope of practice required to practice? As long as regulatory requirements differ from state to state, each state border represents an obstacle to portability—potentially preventing access to professionals and access to care. The Consensus Model for APRN Regulation has the potential to harness this power by outlining regulatory requirements in licensure, accreditation, certification and education that should be adopted by every state. Visit the Consensus Model toolkit, a compendium of resources for understanding the Consensus Model. Watch the Consensus Model for APRN Regulation video that provides a succinct overview of the APRN Consensus Model. See how far your state is in adopting the elements of the Consensus Model. 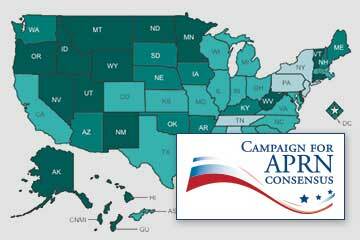 See state-by-state implementation status of the APRN Consensus Model. Contact us with any comments or questions concerning the Consensus Model.